At the time of transition during seasons, there can be hot, sunny weather intertwined with rainy days along with tropical showers and thunderstorms. The first rains at the beginning of the season makes alum and polluting substances in the air and the banks drift down to the ponds, change the aquatic environment, reduce shrimp health and its ability to resist diseases. - Reserve necessary materials such as lime, minerals, vitamin C, bioproducts, etc. - Periodically use bioproducts to boost beneficial bacteria and stabilize water in ponds. - Prepare clean water in settling ponds to provide or replace a part of farming ponds as needed. - When there are signs of rain coming: apply lime around the pond, reduce feed intake for shrimp or stop feeding, when it stops raining, feed shrimp back with a reduction in feed from 30-50% compared to normal. - When it is raining, use CaCO3 or Dolomite lime to the pond with a dosage of 10-15kg/1,000m3 to maintain alkalinity and stabilize pH. Two days later after the rain, add microbial products to the farming ponds. - Supply Vitamin C to farming water and mix it into feed with dosages as instructed by manufacturers. 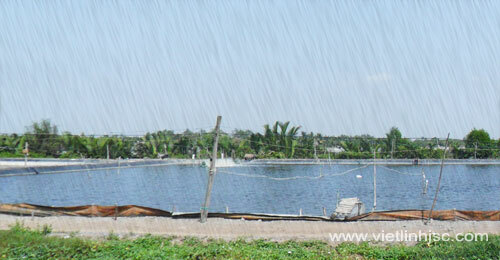 See "Manage shrimp ponds during rainy season"